Extracts from the Report of the U.S. Pacific Railway Commission, 1888. By Robt. E. Pattison. Pattison served as governor of Pennsylvania 1883-1887 and 1891-1895. He was appointed a member of the United States Pacific Railway Commission by Grover Cleveland and was elected its president. 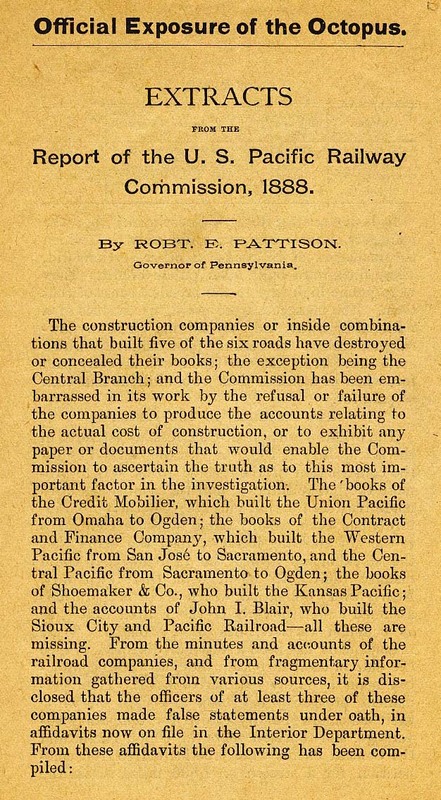 Pattison wrote the Commission's dissenting report, recommending that proceedings be instituted for forfeiting the charters of the railroads and winding up their affairs. Cowan, p. 476. Click to view this article. Cowan lists two versions of this pamphlet, both 1888, both with 16pp. The above version includes a caption title: "Offcial Exposure of the Octopus." The other version is shown in the linked pdf file. Page image courtesy of Heise Huntington. the text of the displayed article can be searched. For help, see Special instructions for viewing PDF files.